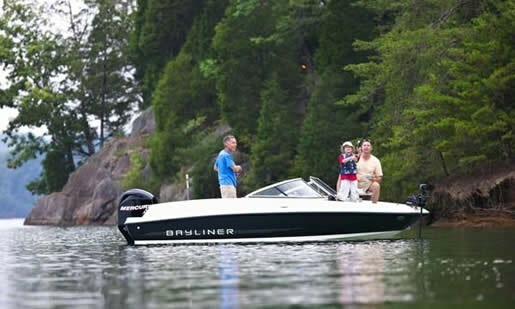 "A stunning newcomer has just joined Bayliner's Outboard lineup for this model year: the sleek and athletic 170. The new 170 Outboard is big on space, storage and handy features. In fact, the only thing small is its price tag." 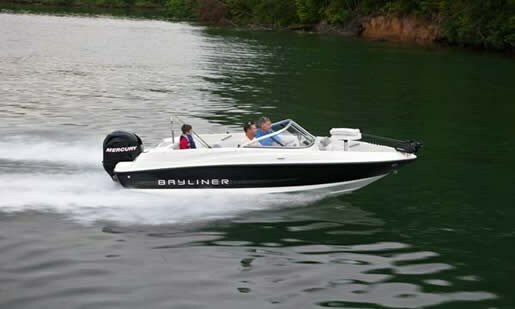 The 170 is one of three outboard-powered bowriders in Bayliner's 2012 fleet, the other two being the 160 and 180. A 190 is promised to be coming soon. The balance of Bayliner's lineup of nineteen models includes six sterndrive-powered runabouts up to twenty-three feet; two deck boats; three Discovery models; and five mid-cabin express cruisers from twenty-four to thirty-three feet. Bayliner started on the west coast of United States in 1957 and has grown to be one of the largest boatbuilders in the world, joining the Brunswick Corporation in 1986 to become part of the world's largest marine company which includes Mercury Marine. The new 170 utilizes Bayliner's proprietary "Beam Forward Design" which carries "the widest part of the beam farther toward the bow, maximizing the usable width of the boat for much more of its length." It also incorporates Bayliner's exclusive Smooth Ride System™ (SRS) which "matches the hull design to its specific application to achieve superior acceleration with fuel-saving lower horsepower engines, a softer ride and a safer handling boat that planes quickly." The 170 offers traditional cockpit seating with a full-width transom bench seat with storage and a removable centre section providing room for a portable cooler below. With the optional fish package, this space is occupied by an 8-gallon aerated livewell. 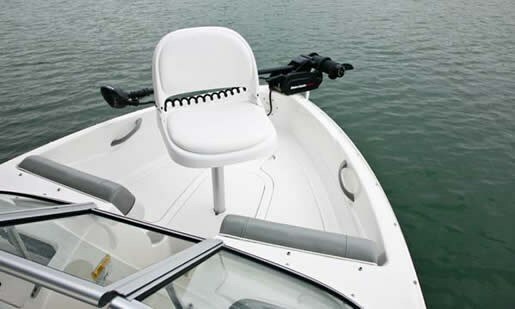 In the bow area is traditional U-shaped seating with a padded backrest on the forward side of each helm, storage below, grab handles, and drinkholders. Additional storage is provided in the cockpit sides under the coamings with netting provided to hold stored items in place plus a large in-floor storage area is intended for larger watersports accessories such as skis, wakeboards, etc. A standard three-step telescoping swim ladder is recessed-mounted into the molded portside transom swim step. Two high-back bucket seats are provided for driver and passenger. The driver's helm includes a dual-instrument pod for outboard power with a separate tachometer plus a three-in-one speedometer, fuel, and volt gauge, plus the normal complement of DC switches and two drinkholders. The steering wheel is padded and tilting. On the starboard coaming next to the wheel is the side-mounted motor controls with trim and tilt switch in the handle. The passenger helm provides a lockable glove box and the location of the optional 120-watt satellite-ready AM/FM stereo with iPod and MP3 docking. Two tailored option packages are available for your 170 depending on your intended boating lifestyle. First is a Flight Series Package intended for fun on the water for watersports enthusiasts. 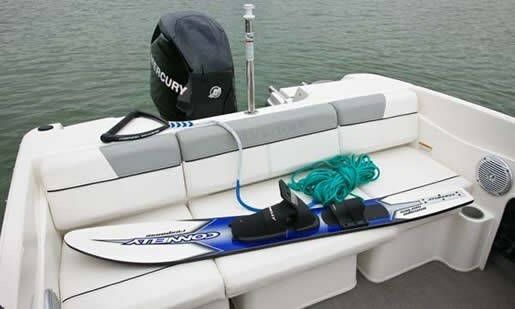 The package consists of special "Flight" hull graphics and a wakeboard tower with integrated bimini top. The second is a Fish Package which includes the aforementioned livewell, a 12V-DC, 55 pound thrust MotorGuide® bow mounted wireless trolling motor with quick removal mount, a Garmin™ Fishfinder - echo™ 150, a removable bow pedestal seat with non-skid bow casting platform, plus hullside rod storage capabilities. Many other individual options are available to customize your 170 including the aforementioned stereo, a ski-tow pylon, Sunbrella® canvas, depth sounder, fibreglass cockpit liner with carpet runners, and a galvanized trailer in place of the standard painted trailer. 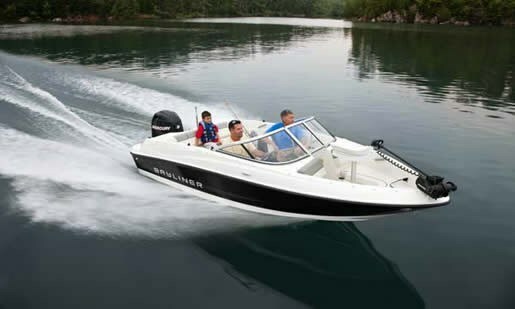 Four engine choices are offered by Bayliner for the Canadian market. The standard motor is a 90HP DFI, Mercury OptiMax direct fuel injected 2-stroke. This motor is claimed to cruise the 170 at almost 27 MPH with a top speed of 38 MPH with over 1,200 pounds of fuel, persons, and gear on board. 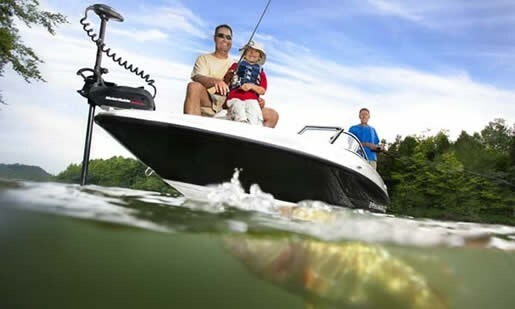 You can also choose the optional 90 or 115 HP EFI 4-stroke, or the 125 HP DFI, Mercury OptiMax 2-stroke. This largest of the motor choices is claimed to offer a cruise speed of 31 MPH and a top speed of 46 MPH. The Bayliner 170 Outboard Bowrider is a great way to get out with your family and friends to enjoy the spectacular activities, fun, camaraderie, and beauty of the waterways of this country.